Creating unique floral arrangements is a true craft. This is a guide about creative flower arrangements. 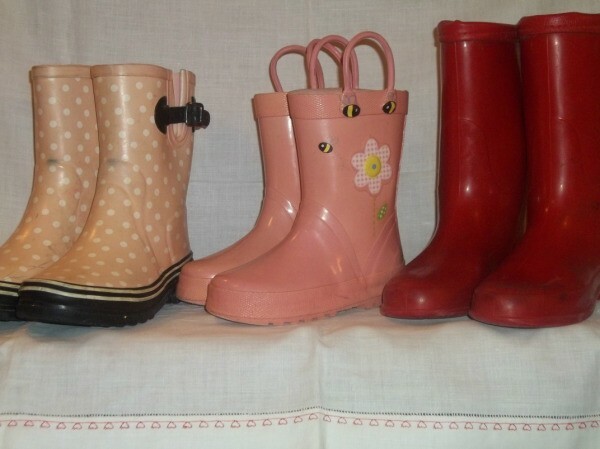 Brighten rainy days with a playful centerpiece made with a pair of children's rubber rain boots. Even though my children are grown, I couldn't resist these boots when I found them at a yard sale. I immediately knew they would look adorable as flower containers displayed on a porch or in an entryway. 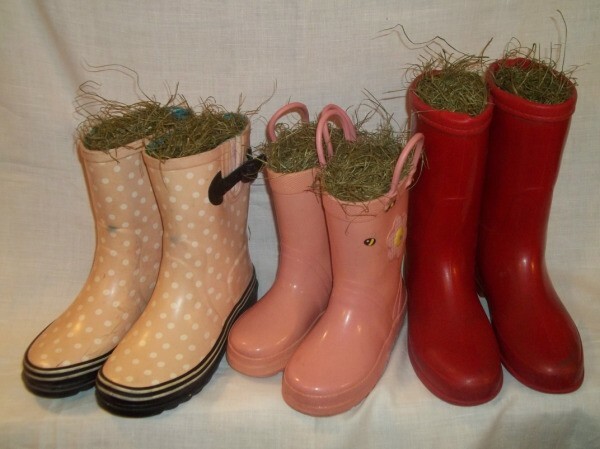 Wipe off the boots with a wet rag and fill the foot section of each boot with gravel. Cut a green floral brick to fit in the leg of the boot using a serrated knife. Apply hot glue around the inside of the boot legs and insert the brick. Apply hot glue to the top of the floral bricks and cover with Spanish moss. 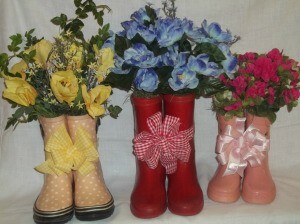 Insert and arrange your choice of silk flowers in the tops of the boots. Place the boots together with the sides touching. Note where the sides touch. Separate the boots and apply household cement to the side of one boot where the boots had touched. Place the boots back together and press to form a bond. This will prevent the boots from shifting when you pick up and move your centerpiece. Wrap a length of floral ribbon around the pair of boot legs and tie into a knot on the front. Do this while the glue is wet. It will pull the sides of the boots together to connect the glue. The exact measurement will depend on the size of the boots. Trim the ends of the ribbon to 1 inch long. Make a multi-loop bow from the same ribbon. If your bow technique uses wire to twist the loops together, cut the excess wire to at least 4 inches long. If there is no wire in your technique, cut an 8-inch length of craft wire using wire cutters. Insert the wire through the knot on the back of the bow with an even amount of wire extending from each side of the knot. Place the bow over the knot on the ribbon wrapped around the boots. Place a wire end on each side of the knot. Bring the ends of the wire together behind the knot and twist to secure. Trim away the excess wire using wire cutters. I saw a "cupcake" that is a small floral arrangement and I'd like to make one of my own. The "paper cupcake liner" looks to be a small terra cotta pot with ridges. The "cupcake frosting" is actually a mound of white carnations. Any suggestions as to how I can achieve the terra cotta ridged "cupcake liner"? I would use a piece of corrugated cardboard with one smooth side removed (this often comes as packing material or you can try splitting the layer away yourself) then spray paint it any color you like. Wrap around any appropriate container, wavy side out, and there you go! I've seen large silicone molds for baking a large "cupcake" cake for birthdays. The mold could be used for the bottom. I would like instructions for a fall flower arrangement, either with fresh or fake flowers. Does anyone have one they would like to submit? Usually I go to Micheal's and get fake flowers. Rule of thumb in floral decorating is to choose three colors and make one a primary color. Fall leaves, burnt red, orange, yellow, brown, purple, pea green are wonderful colors to use, but don't go overboard using each and every one of those colors or the arrangement will look too busy. If using a basket, you can conceal the stems by covering over with dried grasses. I like to put marbles, stones in the bottom to help give added weight, holds pic stems in place while concealing them, and can also emphasize any clear vase for any theme or room decor. 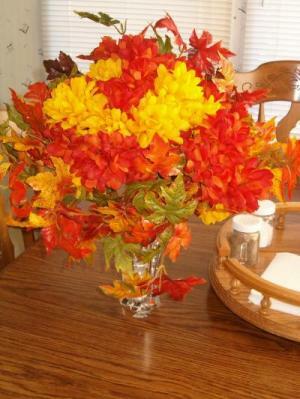 Add leaves in your arrangement, or cattails, or other fall pics or even a curly grape vine branch and build around it. 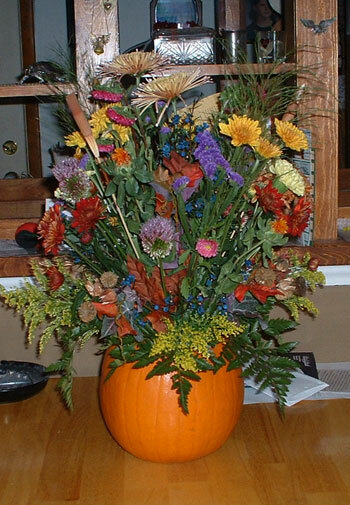 I've attempted to merge a pic of one autumn arrangement I made as an example. The first instructions are great. I had someone give me another tip one time on proportions: The width (at the base of the flowers) should be about 2 times the height from the top of the vase to the highest flower. Start with the center top flower. Then fill in the bottom border all the way around. Last fill in the rest of the arrangement. The pic that Lorelei put up shows that, but she probably got it right without having to really think about it. I am looking for instructions on making a flower arrangement in an ice cream sundae glass. I have seen them and they are really cute but expensive to buy. Any help would be greatly appreciated. You could make the candy ones, have seen them done at the floral shop, etc for all occ. Suckers, mini candy bar,s packs, etc. Get a foam floral frog in the any shape from Walmart, etc. A few years ago I made this item for one of my g'daughter's b'days. Get a sundae glass at Walmart. I used a small round piece of foam attached to bottom, then arranged pink carnations, silk strawberries, 2 straws. She's a very fussy kid, but went crazy over this one! Hope this helps. This is what we did for a center piece for Halloween. We carved out the inside and put flowers inside of it. It does last for about 2 weeks. In the Philippines, it's hard to find a wall of garden plants. 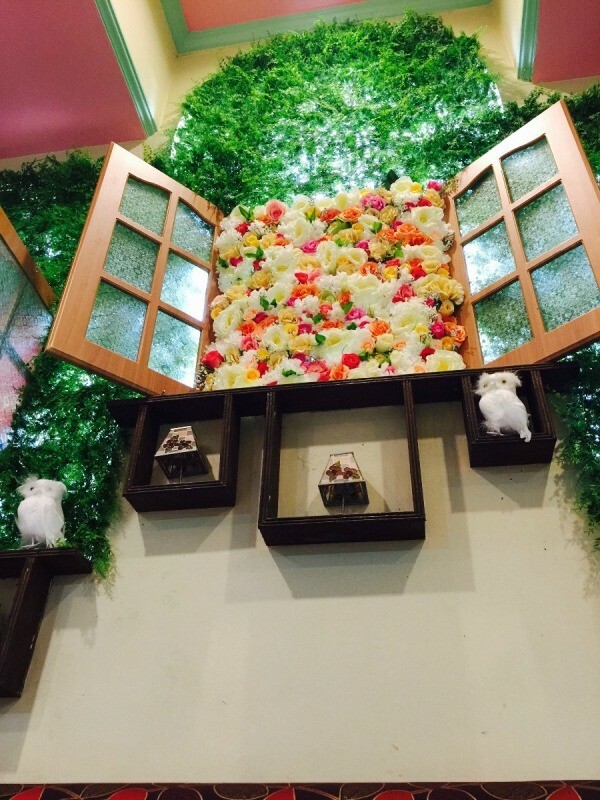 That's why I've been amazed by this very beautiful creation by the owner of this restaurant. I love flower gardens so much that I could just take it home.